Sometimes, work events get a bad reputation. Too often, employees and employers alike view office events as boring at best, and a waste of time at worst. This attitude is prohibitive and like a self-fulfilling prophecy. When workers and managers don’t want to pursue company events, events don’t happen. The few occasions that do occur tend to be poorly planned, poorly attended, and poorly enjoyed. Many large corporate offices and even small companies operate with clear departmental divisions. Your sales team may never interact with your accountants, and your managers may never interact with receptionists. Though this setup works, sometimes it discourages interactions between departments, which can slow down bigger projects. Corporate event planning creates the opportunity to shake up the status quo and inspire fresh collaboration. 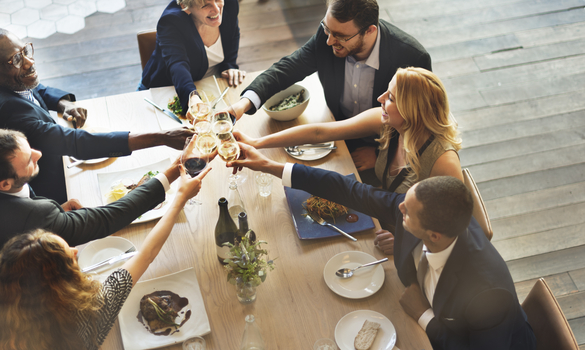 Gathering your team in a new place to spend time learning, doing activities, or just to enjoying a meal together can help spark relationships and cross-department communication. Next time you need the whole company to rally together for a big new undertaking, your teams will be more than ready to come together and take on the challenge. Though hosting Waffle Wednesday may not seem directly related to your company’s goals, studies suggest otherwise. In fact, workers who view their job as fun are more likely to be productive and engaged in their work. Employees who have fun are less likely to miss work days as well. By taking time to let loose, you’ll create a stronger and happier team building culture. A company that’s willing to embrace unusual event ideas is likely to embrace fresh ideas in general. Hosting events in a different place creates the mental and physical space for a fresh start. By giving employees the chance to change and improve their own work duties, you can encourage innovation and keep your company thriving. Foster progress by hosting an innovation-oriented event. Try holding a “reboot” in which teams brainstorm fresh marketing campaigns, product ideas, or office process transformation. Choose a space with a relaxed atmosphere and arrange small groups– individuals will feel more comfortable sharing thoughts in a casual environment. Everyone needs a break sometimes. Burnout impacts much of the corporate scene, causing good workers and managers alike to fall behind. Even if an individual is well-suited for their work, day after day of managing a high workload or monotonous tasks can start to take a toll on their mental and physical health. Don’t let your valued employees feel like they’re treading water, and host a company event. Put on a fun night of cocktails, a company picnic, or even casual Fridays might be the perfect way to re-energize and re-inspire your team. By changing the scenery with occasional corporate events, you’ll break up the workweek grind, and give everyone a shared event to look forward to. This a proven way to retain top talent while getting newer team members to buy into your culture. Don’t knock corporate events before you try them. With patience and good planning, a few well-executed corporate events might even transform your business. After all, a happy, heard, and inspired team is a team that can change the world.